Looking to hire or buy a marquee in Norfolk? Think about marquees and one style probably comes to mind. But the reality is that marquees come in all shapes, sizes and styles. If you would like any more information about any type of marquee then get in touch with our team here at Weatherill Brothers on 01953 882 394. Here’s a quick look at some of the more unusual varieties. 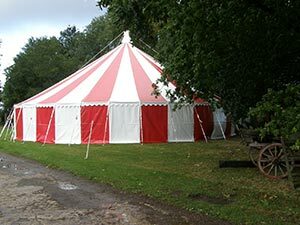 As the name suggests, this kind of tent is supported by poles and ropes and looks like a classic circus big top. They can’t be set up on hard surfaces which makes them slightly less versatile. One of the most common designs. This tent uses a frame to support the canvas and so it can be free-standing, even on concrete and other hard surfaces. A traditional Mongolian-style dwelling, the lattice walls and wood-ribbed roof are all covered in fabric. They can be somewhat limited in size. Styled after the Native American tepee, these tents offer a unique shape and create a cosy atmosphere for your event. They can be configured to cater for both large and small gatherings. Want to let the sunshine in or dance under the stars? A clear vinyl top lets you bring the outside in. From stronger frames to more breathable linings, we can make marquees that can last throughout the year. And, combined with an efficient heating system, you can use you marquee even if it’s snowing or freezing cold outside. We can also custom-make flooring, drapes, windows and more, all helping to create more permanent marquee structures set up for year-round events. To find out more about what we do, get in touch with a member of our team.